"I signed up for this class not really knowing what to expect. 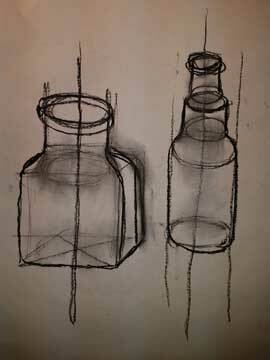 I am very much a novice artist and have never attended a drawing class before." The class started in the morning by describing the correct way to hold drawing/painting tools to allow freedom of movement, we then moved on to describe how any object that you want to draw can be broken into three shapes. Victoria described that by looking at a light source and adding shading you can add three dimension to an object. It is interesting that when someone breaks a complicated phenomenon into smaller pieces, it seems so much simpler and makes sense, even in the art world.After some simple exercises drawing cubes, spheres and prisms, we progressed to using those shapes to draw our eclectic collection of objects that we had brought to class. Who would have ever thought that you can draw anything from three simple shapes? By looking at multiple objects we started to see proportions and how to use negative space. By lunchtime we were all looking very differently at cups, tortoises, vases, bottles and toucans. Definitely more looking than drawing. After lunch, we moved to painting with the Golden High Flow acrylic paint - what a cool product. The first exercise was to try different brushes and strokes just to see the effects. This was kind of fun, although the resulting product would have fitted in well on the of the wall of a pre-school class! Using the techniques we developed in the morning, we moved to drawing with the paint, then continued to build our repertoire, adding texture. By the end of the class, there were a lot of very different and interesting drawings and paintings. I hope that everyone got as much as I did from the class - it certainly was fun and inspiring.